Join us at our Monthly Meetings. Or use the Calendar as your guide to all TCGS events. Already a Member? Explore our Member Resources. Not a member yet? Learn more About Us and the Benefits of Membership in our society. Explore our society’s Research Capabilities including resources in our library catalog. Perhaps we can assist you in obtaining the record(s) you desire. Learn about Recent Changes to our website. 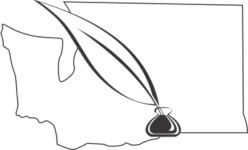 Links to other online sources of information for Benton and Franklin Counties and for nearby counties.